Scarring is the process by which wounds are repaired. Scars produce a structural change in the deeper layers of the skin that is perceived as an alteration in the architecture of the normal surface features. Why does a scar appear? Scars occur when tissues have been significantly damaged and repaired. Scars result in changes that alter the physical architecture of normal skin or other tissue. 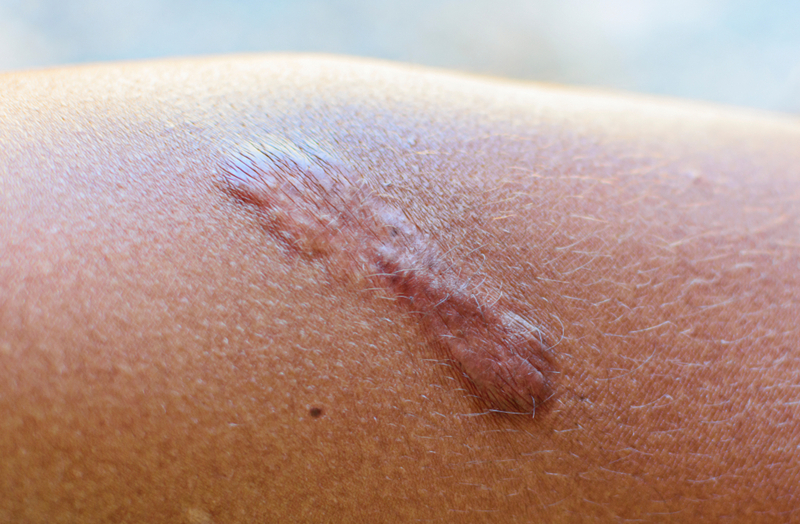 Scars can occur after physical trauma or as part of a disease process. Poorly controlled wound healing can result in thick, unsightly scars that cause symptoms. There is a genetic predisposition in some people to produce thicker, itchy, enlarging scars called keloids. Scarring in areas of increased skin tension or movement tend to be unsightly. When wounds are produced surgically, physicians utilise techniques to minimise scarring. Since scars are part of the normal healing process, ordinary scars are not treated. Only when superficial scars become cosmetically undesirable do they require treatment. Scars in anatomical regions known to produce thick scars and scars that produce a significant, unpleasant distortion of adjacent anatomical structures. Thick scars can be flattened by dermabrasion. Certain types of depressed scars can be elevated by the injection of a cosmetic skin filler. Certain types of facial scarring respond well to forms of laser treatments. Occasionally, surgical revision of scars can result in a different scar that is much more cosmetically desirable. Since it takes about a year for scars to mature, it is frequently prudent to wait before starting any invasive surgical revisions.